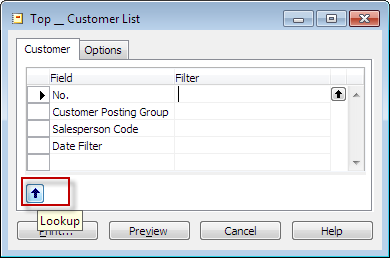 Saving filters in Dynamics NAV – Filter Selections: Practical usage of Rec.GETVIEW and Rec.SETVIEW. Over the years of working with NAV, users have always asked for ways to store their frequently used filters for reports and forms – eg. month end reports (A/R, A/P, Trial Balances), that often needs to be reported in multiple views. Most often the users have come up with a system of storing the filterstrings in Notes in eg. Microsoft Outlook or similar. This is not a productive way, and leaves a lot of options for errors when copying the wrong filter, especially when filtering on multiple fields. Other ERP products, such as Great Pains has this option as standard, called “Report Options”. These can be setup and saved by the user, and then accessed through “My Reports”. And also need to do changes to existing objects, where we want to make the functionality accessible. In this example we set up a single shortcut key on a existing menuitem with the shortcut ALT+F7, but you could also add buttons to the form, for loading and saving the filters, if this makes it easier for users to understand. Most of the field should be pretty self explanatory for most developers; and you will see comments in the “Description” field explaining the properties set for the field. 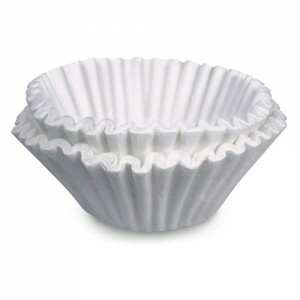 Next step create our form to get and set the filters. For simplicity this could be created as 2 separate forms, but for now lets take a look at how to handle this in one form. 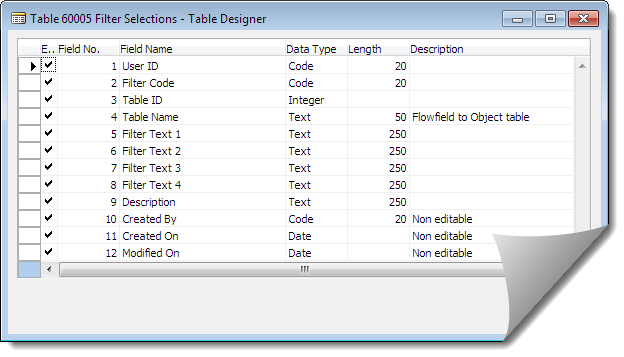 Where FilterSelection is local variable to the previous form we created. HI Søren Nielsen, My comment is not related to the post but If possible please enable RSS or Atom to you site, so that outsiders can be notified automatically. The RSS feeds already exist, just look at the right side of the address bar in your browser – there should be a RSS feed link. I have now added direct links on the pages too. Have fun! When I click on the download file the website transfers me back to “home”. Could you make the file downloadable ? 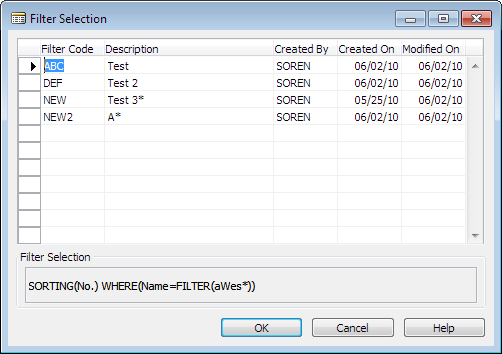 We have Dynamics Nav 2009 and even if there is some filters saving capabilities on RTC, it’s not possible to save filters on worksheet pages. So i’ve used your idea and replaced the Form with a Page to select the filter and it does the job perfectly ! Thanks again (from France) !